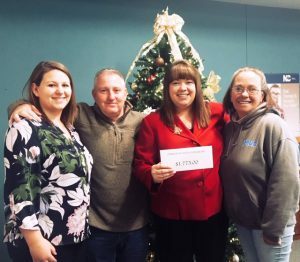 More people in Currituck County will receive gifts on Christmas Day thanks to a large donation given to the Department of Social Services (DSS) for the Operation Santa Claus program. A fundraising drive spearheaded by Joey Davidson raised $1,775 for Operation Santa, which aims to provide toys for local children and food baskets for senior citizens during the holidays. Early in November, Davidson challenged county first-responders and citizens to donate toys or funds for Operation Santa. On Friday, Nov. 30, 2018, Davidson presented a check to Samantha Hurd, DSS Director, and Heather Corbell, DSS Administrative Officer. Also present for the donation was Dawn Smith, a longtime volunteer with the Operation Santa program. Applications for assistance from Operation Santa are being accepted until Dec. 7, 2018 at the DSS offices. For more information, contact the office at 252-232-3083. Citizens may learn how to make a donation to Operation Santa in the form of toys or gift cards.